Joe Nester has been with Brookside for over 25 years. Before he joined Brookside, he was very successful in the retail fertilizer business, but realized that he wanted to be doing more in the field and agronomy work, so he decided to was time to start his own consultant’s business. He didn't learn about Brookside right away, he had someone else tell him about Brookside and what all we offer as a company. He looked into our company and realized it would be an excellent fit for him. So that is how Joe became a consultant with Brookside. Joe has been very successful running his business over the last 25 or so years. He has learnt a lot and had to go through all the battles of starting your own business. Starting your own business can be risky but reaching out to guys like Joe to hear their battles and success stories is a great place to start for someone that is looking to possibly do the same. Brookside has many wonderful consultants, like Joe, willing to offer advice and knowledge to anyone looking at getting started with Brookside. 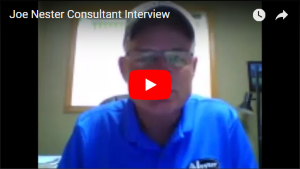 Check out Joe's consultant interview or any of the other interviews that we have done with our consultants to hear about their journey to Brookside and success that they have had. Joe offers some great advice during his interview.